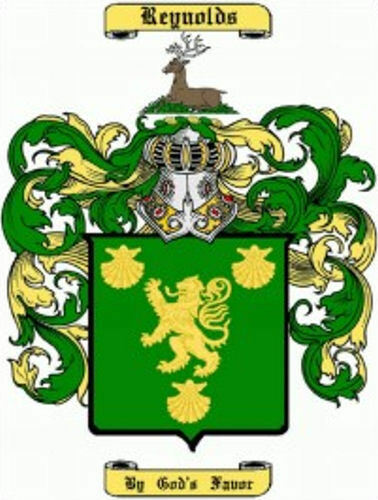 Reynolds Family Coat of Arms. 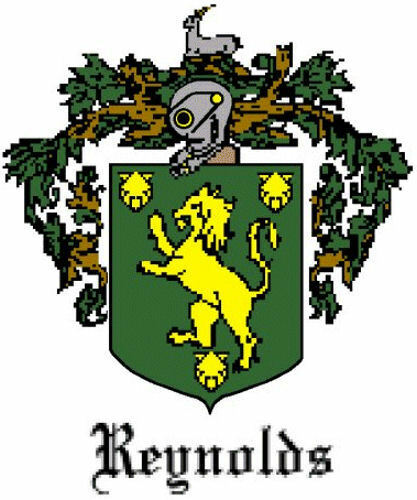 There is no such thing as one official Reynolds coat of arms. 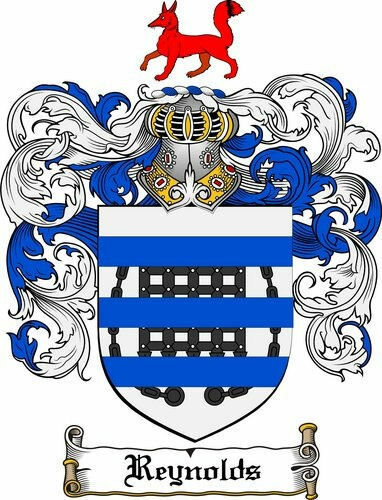 Coats of arms were granted to individuals, not surnames. They may be used by the descendants of the person to whom they are granted, but not by others who just happen to have the same surname. 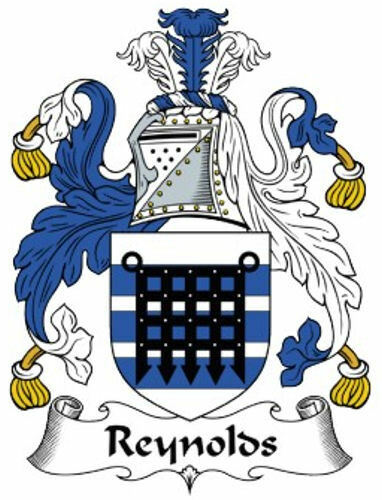 Below are several different Coats of Arms that bear the Reynolds name. 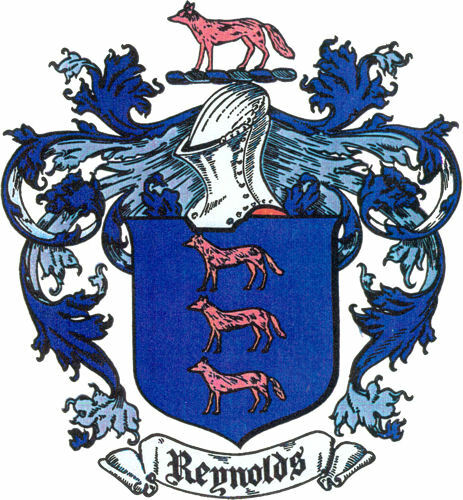 A resolution by Mr. Howard Reynolds, of Boston, MA was offered, to the Reynolds Family, providing for the appointment of a committee whose duty shall be to suggest a dignified design for a coat-of-arms for the Reynolds family and submit same at the next annual meeting of the association, said committee to be appointed by the chair. The Motion carried and the following was taken from the RFA Annual Report in 1901. Report of the Arms Committee. By Howard Reynolds, of Boston. 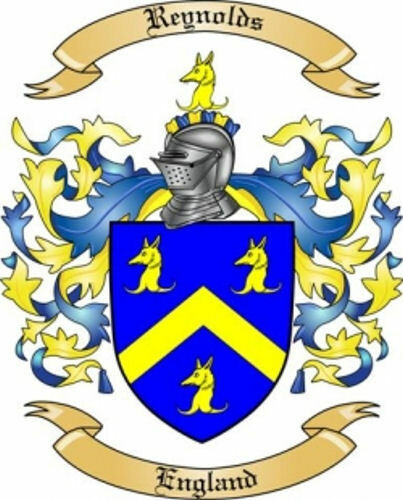 Resolved, That an heraldic device of three gold foxes statant upon a shield of blue with a crest of a gold fox statant, be adopted by the association as its official badge and emblem, to be also used by the members for the marking of their private property, as a seal, or in such manner as they may desire. While it is not claimed that the descent of every member of our association from the ancient Norman family of Renard which bore this device can now be indisputable proven, the insignia proposed has some probability and is of more significance and interest than any other which the association can adopt. Now I will say further that Vol. III. Of the Battle Abbey Roll by the Duchess of Cleveland, gives five names of Renard in the men at arms who came over from Normandy with the Conqueror; that this same device of the three foxes obtained more than five hundred years ago in the French family; and that its antiquity is to a certain extent guaranteed by the fact that in the earliest times the symbols adopted were largely representations of animals. As a rule they adopted what they called a "canting" device, that is, an allusion to the real name of the proprietor, simply that the illiterate men at arms should at once distinguish it. 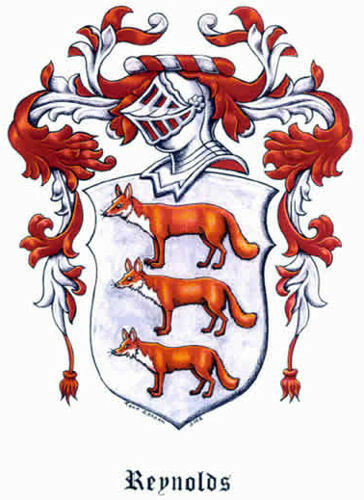 My cousin, for instance, whose name is De Wolf, comes from an old line and has a wolf as his crest, and for the same reason the old Norman name of Renard has the fox, which is of course for the sake of the illiterate men at arms who would immediately associate it with the name as they would not perhaps a star or a circle or some such device which has no possible connection with the name. Now that being the case, my proposition is to adopt the French coloring, which was a blue shield with three gold foxes upon it, as the general seal of the association and the private make by which the members may identify each other on occasions when they meet; and I have had prepared, as secretary of the arms committee, a rough sketch by an able draftsman who understands such matters, and I wish to submit that to you all so that you can inspect it at your leisure, and possibly later, I hope, decide as to whether it would be suitable to take that as a mark of the association. I wish to say, carrying it a step further, that I think it would be of considerable interest to the members of the family to be able to have copies of this device in the proper colors. I picked out Mr. Henry Mitchell, of Boston, who is recognized as being an authority on heraldry, to make a drawing, and this sketch, although it is somewhat crude, will give a very good idea of it. I also had some estimates prepared for my own satisfaction to see what it would cost to produce these in the best lithography and of suitable size to frame and hang if people chose, and I found that my estimate on two was rather faulty because I could get five hundred just about as cheaply. I found that the total expense for five hundred would not be over eighty dollars ($80). That would mean that if the present assemblage here would agree to take two each at fifty cents apiece, we could immediately have the device printed and always preserve it, and there will be a quantity of copies remaining which as they were sold from time to time the proceeds could be turned into silver badges of a similar design which could be distributed among and worn by the members as they might choose. That is the report of the arms committee. Motion made and carried that the report of the arms committee be accepted and the resolution contained therein adopted. 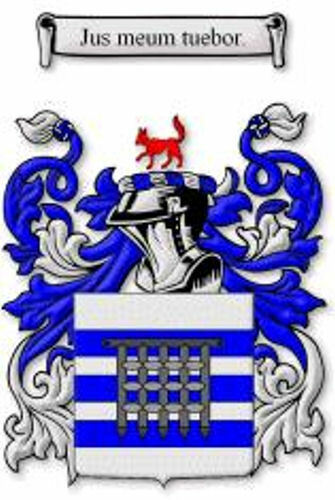 There are many books and web sites dedicated to Coats of Arms and Family Crest. You may want to see if you can discover the one issued to one of your ancestors. A very excellent book on Heraldry is "Heraldry and You, Modern heraldic Usage in America by J. A. Reynolds.